I think it would be nice to remember the throttle settings for the next time the throttling is activated. Every time I set the throttle I have to enter the 75 and change the mb/sec to kb/sec. (I do that every morning because over the day I need the upload for remote working bandwidth). Would be nice to remember. I think it is realistic that a user “reused” the last throttle settings. For me a cookie would be fine. Awesome use of QoS (Quality of Service) for those that have (and know how to use) it on their routers - thanks for the suggestion! QoS is a good solution if your Network Devices support this. Duplicati supports a Throttle! Up and Down. The feature is there and it is working fine. Alternatively perhaps consider QoS. I tag all backup traffic with a certain QoS value. This was my suggestion in another thread. How did you identify “backup traffic” so it could be tagged? I’m familiar with how to tag things on my router, but I’m at bit at a loss on how to identify backup traffic. I’m using Backblaze B2, so it’s outgoing https traffic, and coming from 3 or so devices on my network, but two of them could be on of of a couple of different VLANs. Is there a way to classify just the backup traffic that doesn’t involve a specific set of source and destination IPs? I found a possibility if you have only one instance of Duplicati: NetLimiter 4 for Windows. Unfortunately not freeware but it fits for me! The Pro version costs about 30$. Maybe the Lite can do also the limitation then 20$. You have many possibilities. You can limit the internet speed of the process (duplicati.gui.tryicon.exe). You can set this limits “by hand” manual or with rules => eg. enable the limit 23:00 and disable it 06:00 or you can limit it by target (eg. 85.214.4.102 for the Cloud of Deutsche Telecom) or you can set priorities (I have not tried this yet) or you can set limits after reaching up/down quotas (also not tried this). 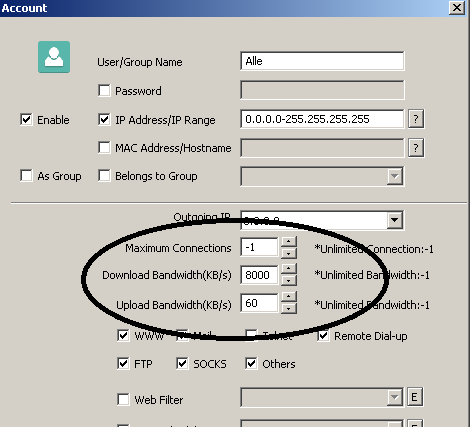 If you have more then one PC with Duplicati a possible solution would be to redirect the traffic of all Duplicati-PCs thru a proxy and then use a proxy which can throttle different users. Eg. CCProxy (costs about 4$/year). Thanks for that suggestion, it looks really useful! Overlapping times would likely use the FIRST time and speed specified. Not that times are likely approximate such that a speed change won’t start until the next upload begins. In other words, if it takes 15 minutes to upload a file started at 8:59 AM then the new speed may not kick in until 9:14 AM. Note that in this concept there is no day-of-week adjustment possible. My initial question was much easier! I just asked if the GUI can remember the last value. So your suggestion would be a possibility but I this it much more complex than “a little gui improvement” (remember in a cookie or something like that). My initial question was much easier! Absolutely - adding a cookie should be easier than adding an advanced parameter. But I know a number of people have asked for throttle scheduling as well. Is there a way to set the global throttling via the command line using --throttle-upload? I don’t want to actually run the backup command to start a new set. I just want to make adjustments globally. Hi @brianmaas, welcome to the forum! I’m not quite sure I understand what you mean. Yes, you can use --throttle-upload in command lines and it will be applied where it’s applicable (though you might get an “unrecognized parameter” if it’s not applicable). You can also use the global main menu “Settings” link to set --throttle-upload there and it will be applied to all jobs (unless the job has it’s own specific setting which will then take precedence). I am told that Duplicati has environment variables that can be used in scripts. They are usually DUPLICATI_. Can someone point me in the direction of the Duplicati environment variables for Linux, in the documentation? This would allow scripting functionality for the GUI pause and throttle buttons. I may still not be following you - are you wanting to let jobs run at “full speed” then use some other scheduler to to be able to shrink and grow the throttle through command line calls? Exactly. And just pausing the entire system. Now that I understand what you want to do, I can definitely say…I have no idea. I know other users have used QoS (Quality of Service) settings on their routers / gateways (Throttle Bandwidth After Backup Has Started?) or third party apps (see NetLimiter above) that throttle specific traffic or network connections, but I’m betting that @Pectojin will have a thought or two on possibly doing what you’re describing. I’m betting that @Pectojin will have a thought or two on possibly doing what you’re describing.